OK, I might as well say it now. I love wombats. Ever since I was little and my Nan brought me a toy one back from her trip to Australia. I think of them as the greatest animal in the world. Now that Im here myself, I’m borderline obsessed with finding one. 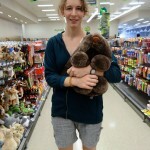 I’l try not to go on about them to much as I know how annoying I can be but, I LOVE WOMBATS!